Peugeot has premiered its updated 208 to the public at the Geneva Motor Show ahead of its introduction to showrooms in June. 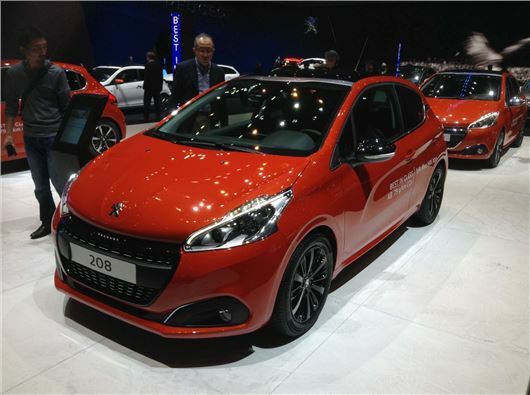 Prices should remain largely unchanged – the 208 is currently available from £10,195. A redesigned grille and front bumper is the most obvious change, but there are new tail and headlights, new alloy wheel designs and new colour options too, plus tweaks to interior materials including a leather-trimmed steering wheel on most trim levels. The touchscreen system, which is standard on versions of the 208, has been improved to offer better connectivity with smartphones. Drivers can use most of their smartphone apps on-screen when stationary, or they can use driving apps such as navigation when on the go. Peugeot has added a new trim level to the range called GT Line. This adds styling cues from the high-performance GTi but uses a more affordable 110PS petrol or a BlueHDi diesel with a choice of 100PS or 120PS. Engines benefit from efficiency improvements, with all diesel models offering emissions of below 95g/km – meaning free annual road tax. Diesel models are offered with 75PS, 100PS or 120PS. The three-cylinder petrol engines, offered in 1.0-litre or 1.2-litre forms, don’t come in at below 100g/km but they’re still impressively economical. Petrol power outputs range from 68PS to 208PS in the hot GTI model.